Our first stop was Housing Works on Crosby Street. They have clothing and homegoods on one side and books on the other. This shop is cool! You'll find vintage mixed within the regular thrift shop finds. That's where we bought the Goldman Sacs sponsored team baseball shirt. We found several more things that we would've scooped up but we couldn't get American Airlines to make this an official pickin' trip & haul our loot instead of the other passengers luggage. The rest of the way... you're pretty much just window shopping. THAT IS UNLESS YOU MEET KAREN. 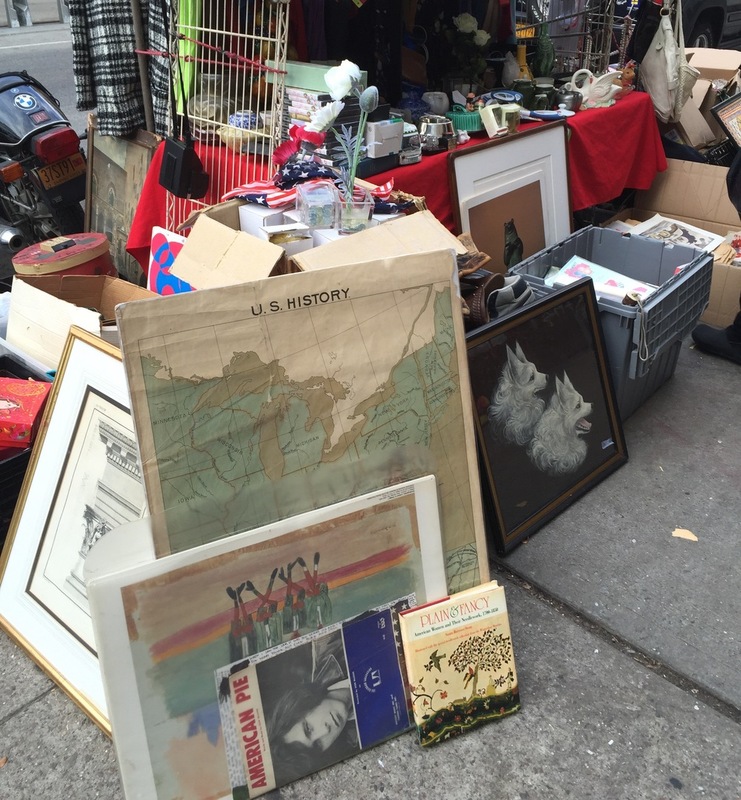 On a street corner in the East Village, after we finished with Housing, I spy from across the way what looks like a tiny, make-shift flea market. As I hurry across the way--dodging cabs and holiday shoppers!--I was cheerfully greeted by a leathered-faced woman who (unbeknownst to me) had just witnessed my hasty sprint from the opposite corner. She had the appearance of a street person but she was sharp, and I could tell she was a businesswoman. Life & the cold New York winters have not been good to her. Yet, there is a beauty that resonates from her soul. A fellow picker sister - she is. She had built her career on the streets. This corner was her selling grounds. As I scour through the stacks of boxes that she had assembled of someone's discarded past, I discover treasures that someone once loved and someone else threw away. She quickly catches onto my enthusiasm for her stash. He/she had been a collector of paper. Under the dusty old newspapers proclaiming NYC's celebration of the Statue of Liberty, a few old black & white photographs, old play bills, and vintage sheet music..... I strike gold! I carefully pull a large wrapped flat object from the back of the boxes. Looking up at Karen, I smile. She smiles back, "You like that don't you?" It is an amazing 1890s map!! Digging deeper into the stacks, I find more: I uncover two large vintage teaching prints for art class, a vintage American Pie music sheet, a book on early needlework, and a cool piece of original outsider art!!! I'm telling you, this is amazing. SO - if you go: Karen sets up shop every Friday at St. Mark's Place & 2nd Ave. in the East Village! "Even when it's cold," she says. "Even when it's cold." Friday was a beautiful day for both of us! Let us know if you ever meet Karen.